Insane Inflatable 5K came to NIU in DeKalb, IL on September 19th! I had a good time, but I must admit that it could have been so much better!!! There were a lot of things that were really lacking with this race. The Chicago location, anyways! 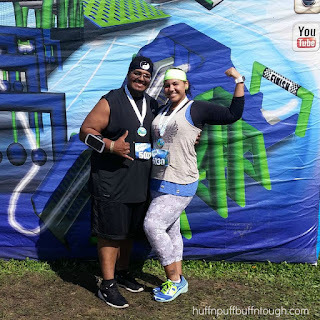 My husband and I were signed up for different wave times because I thought we already had him registered and come to find out, two weeks before the race, he was not registered and my wave time was already sold out. I was signed up for the 9:45 AM wave and he had to sign up for the next available wave that was closest to mine and that was 10:15 AM. In the end, it really didn't matter which wave we were signed up for because we both got to run together and in a later wave that neither of us signed up for due to a huge backup at the packet pickup tent. I got there around 9 AM and got in line somewhere about 9:20ish. We were in line for about 45 minutes. It took us a little more than an hour to get to the starting line. The volunteers at the packet pickup station were slightly disorganized and the little girl who was working alongside her mom made things a little slower, but she was very nice and as were the rest of the volunteers. The little girl ended up giving us both the same time wristbands for the 10:15 AM wave even though it was well after 10:15 AM and it was pretty clear that we were running in whatever wave we chose to after we made it through packet pickup. 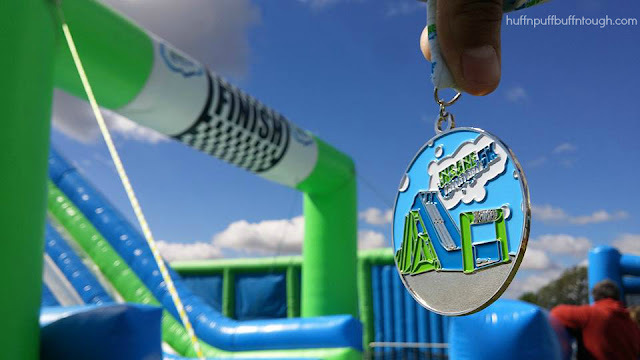 As long as you were wearing a wristband, no matter the time slot it had on there, you were let in the starting chute. I got my daughter set up with her grandma before I headed to the starting line. They had a lot of tables and chairs set up for spectators to sit and enjoy. I thought that was so freaking awesome!!! You were able to bring your own chairs too, but I love that they provided the spectators with tables and chairs. 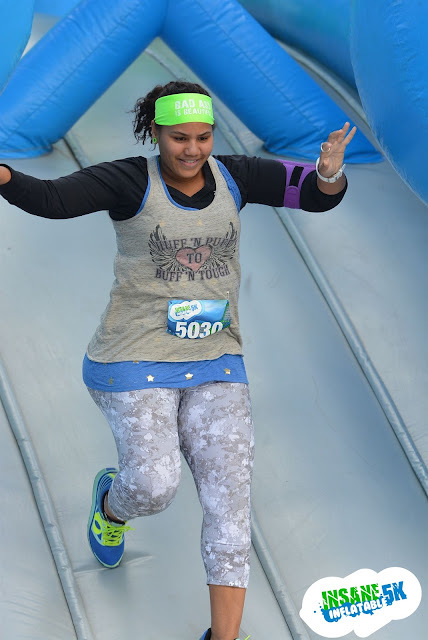 My energy was lacking on race day and I got way more exhausted on obstacles than I usually do (and those were EASY), but I was just trying to have fun and make the best of the whole experience. I felt that the race was seriously lacking in the obstacle department. 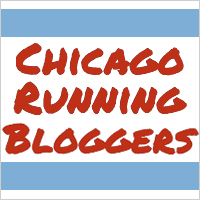 There were two obstacles that were not available to us at the Chicago location. The Mattress Run obstacle was deflated, so we were forced to run over it, but I tried to only step through the holes, rather than running and trampling on it. Another one that was not available to us was the Jump Around obstacle. That was also deflated. I heard many reasons as to why that one was deflated ranging from the weather, which wouldn't be a valid reason, to some busting it. There were only two photographer throughout the ENTIRE course. One at Big Balls, and the other was at the Finish Line obstacle. The Midway games were enjoyed by more of the younger crowd. 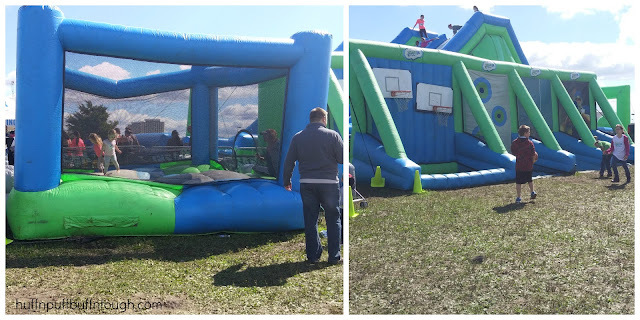 They had inflatable basketball and a bouncer for the little ones. Packet Pickup tent was slightly disorganized. I did not like the course. Two obstacles were not available. I did not have the strong urge and eagerness to want to do this again when it was over. I love that they provided a comfortable atmosphere for the spectators. 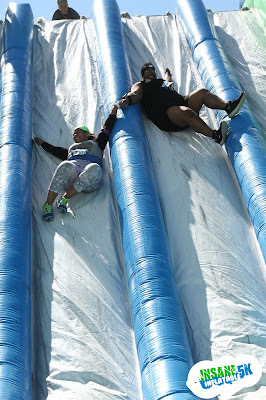 The obstacles were fun, but were extremely easy. 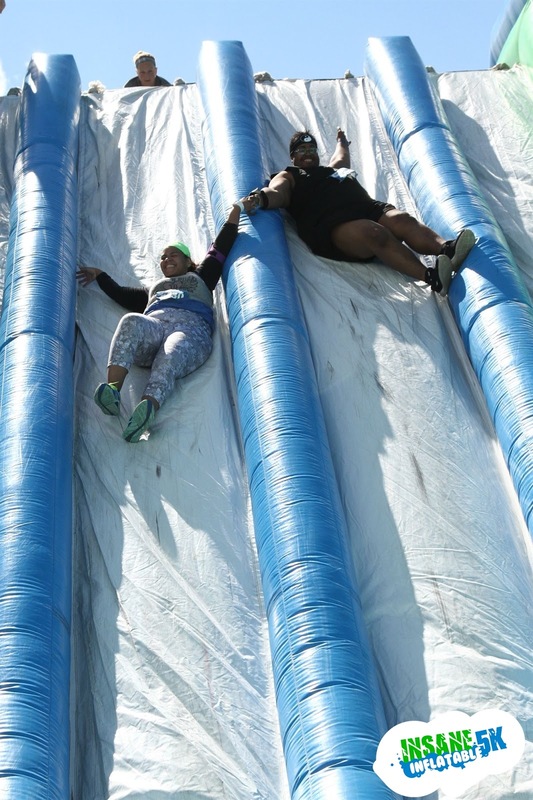 Unless a few changes happen with the Insane Inflatable 5K, the chances of me doing it again are slim. 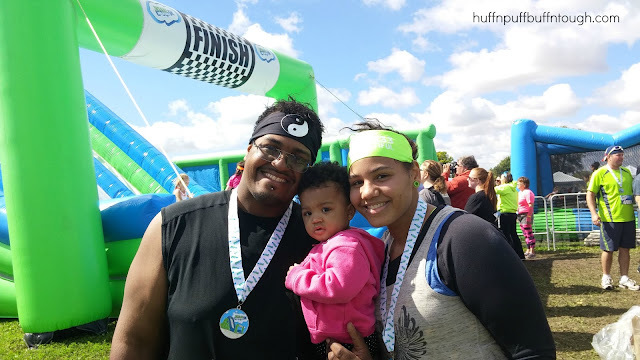 I've done this race too! It was so much fun! I did it in Tuscaloosa AL! How cool I just noticed your tank has your blog name, which is fabulous by the way! 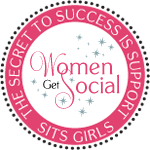 I found your blog through Kristy's upcoming hop! I can't wait to get to know you and connect with you! I love the colors of your page too! Very nice! Thank you for stopping by! It was fun, but I felt that it could have been better. I got bored in the middle of it. And thanks!! It's one of my favorite tanks! Can't wait to connect with you! !